Autoventshade - Bugflector II Full-height wrap-around version of the bugflector provides maximum hood, fender and windshield protection, with a sleek aerodynamic appearance. Available in smoke or paintable clear impact-modified acrylic. Mounts away from hood for easy cleaning and waxing and it's car wash safe. The AVS Bugflector II® is designed to protect and complement the contours of your vehicle's hood ? keeping it looking showroom new. 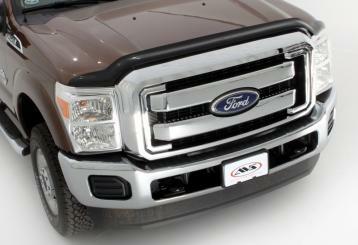 This custom-molded hood shield is made in the USA and precision-engineered to fit your vehicle perfectly. This hood shield's high-profile is aerodynamically efficient and provides excellent protection as stones and other debris ricochet away from your hood, fender and windshield. The shield's durable impact-modified acrylic material makes this accessory wear-and-tear resistant. Your vehicle's Bugflector II can remain on the hood and is car wash safe. The accessory can also be easily removed from the hood for simple cleaning. The set includes installation instructions and any required hardware. The AVS Bugflector II offers you a simple, no-drill installation process easily completed at home in 10 minutes or less. The hood shield is mounted using double-sided 3M tape or mechanical fasteners (depending upon the vehicle). In order to protect the hood paint from rubbing, the set includes several rubber bumpers applied to the hood during the installation. The AVS Bugflector II is available in a smoke finish and is one of the best-selling products throughout North America. A Limited Lifetime Warranty protects your AVS Bugflector II. Buy yours today and you'll be ready for whatever the road throws your way.